This week we welcome The Brother Spies.. I mean, The Other Guys! 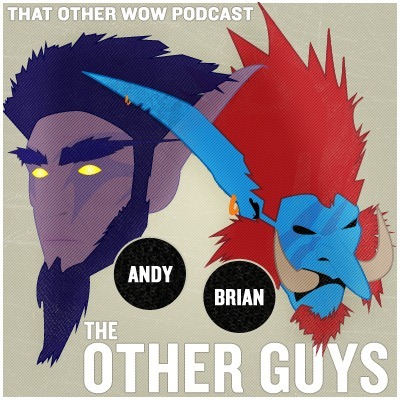 We’ve got Daewin and Brian from The Other Guys Podcast! Join Fimlys, Hydra and these two “sidekicks” gone Super-Hero as we discuss the velocity of an unladen African swallow. The blues are all over the news and we also discuss what we think about the recent increase (read, explosion) in the number of hotfixes being released. All that and, of course, Rilandune serenades us with another episode of The Addon Junkie.. Don’t miss it! Changes to the exalted…..to get the exalted in title, you needed 40 exalted factions, now with Cata you need 50 exalted faction. This is the first title that they removed from players, making players re-earn it. … and then they reverted some of it. LINK Keep this in mind when you are planning on going for big achievements. Get it done before a major patch. Or know they have demonstrated they may make the achievement farther to reach. Naithin from Fun in Games suggested that, as a Shared Topic, we talk about that boss learning process. I think that in the vast majority of Cataclysm encounters — raids in particular, but I think the same is true to a degree for heroic encounters too — are getting easier by some factor other than gear. You may disagree on that point, perhaps, but if so why? Now the obvious answer besides gear is just practice. Practice makes perfect and all that. But why is it that certain encounters start out feeling almost impossible. You seem to be hitting your head against a brick wall, unable to make even a dent in the progression of this encounter. Depending on how long you go through that phase, it may even begin to feel a bit disheartening and then… Then progress is made. It starts to feel possible. You down it. A little later, even just a week or two later, you can’t imagine ever having difficulty on such an easy encounter. Anyone wiping to this must be a noob! What happened to get from one point to another? The second Topic is about our new profession: Archeology. Ringo Flinthammer of Flinthammer Hall pointed out that it was high time that we Share our impressions. Cataclysm’s new secondary profession, archeology, has gone through a lot of changes since it was first announced — Path of the Titans, we hardly knew you! — but is incredibly popular with players. At least, a lot of them are doing it — there are also a lot of complaints. Still, go to any dig site and you’ll see tons of eager archeologists. What do you think of it? Did Blizzard release it half-baked? Are you happy with its current implementation? What else do you hope to have added to it in future patches? Next week is Episode 120 on March 5th, 2011 with Blacksen of the blog Blacksen’s End. Visit us on the blog for further updates or on Twitter @TwistedNether.